We do not curently have theatre tickets available for Argentina vs Australia This could be because we have simply sold out or it could be that this show is no longer running. The information on this page remains purely for historical and informational purposes. 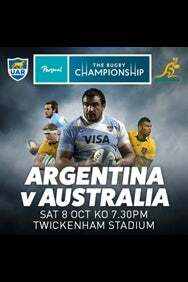 The Rugby Championship comes to Europe for the first time in history when Argentina and Australia play at Twickenham in London on 8 October 2016. The match will be the final game of the 2016 tournament so both sides could be fighting for glory when they head for the UK. It’s also a repeat of last year’s Rugby World Cup Semi Final, a result the Pumas will be keen to reverse as they aim to topple the Wallabies, the current Rugby Championship holders. Both sides will be bristling with rugby talent with the likes of Israel Folau, Kurtley Beale, Bernard Foley, David Pocock and Michael Hooper taking on Juan Hernandez Martin, Nicolas Sanchez, Santiago Cordero, Augustin Creevy and Leonardo Senatore in what promises to be a high octane affair with both sides playing a fast expansive game. The Rugby Championship replaced the Tri Nations in 2012 as Argentina joined New Zealand, South Africa and Australia in the expanded tournament. Since then the Pumas have risen in the world game and are now capable of beating anyone on their day with a mix of power and pace.